Just a reminder that this coming August 6th in the first Friday of that month, the day of the next Session hosted by yours truly. "So I ask for this 42nd Session that you write about a special place in your life, and a beer or brewery that connects you to that place. It can be the beer from your childhood home, a place you once lived, your current hometown, a memorable vacation you once took, or a place you've always wanted to go to but never had the chance. Please take a few moments to think about the how the beer connects you to this place, and share this with us. Of course, the definition of "place" is rather open ended, and in some cases, highly debatable, so it will be interesting to see the responses on what constitutes a place." Look forward to reading what you all write next week! A recent announcement by Runners Drink Beer of their upcoming Beer Mile on August 5th brought back memories of the Chunder Runs I used to run in back in my collegiate cross-country days. Chunder is Australian slang for barf, and the legend was that the original Chunder Runs started in Australia and consisted of about 10 miles and several beers. Each runner had to carry a bucket and anything they could hold down was supposed to expelled into the bucket and carried all the way to the finish line. The Washington University Cross-Country Team Chunder Run, held around midnight once the season was over, didn't involve any buckets, but was five miles long. A twelve ounce beer was consumed at the start, and then after each mile, and once you crossed the finish line, you had to finish another 12 ounce beer before your race was officially over, so a six-pack was consumed over the course of the five mile run. With that many beers over five miles, some pretty serious projectile vomiting was basically unavoidable. And running flat out, as fast as I could go, with my whole body numb and my mind hazy from the alcohol is pretty surreal, not to mention a bit dangerous. I am not kidding when I tell you that winning the 1985 Washington University Cross-Country Chunder Run is one of my proudest running accomplishments. I later learned managing a track and field listserver in the mid-90's that "Chunder Runs" were pretty common with distance runners all over the world. Someone brought up the topic during the off-season, and all of sudden the listserver was full of posts describing various Chunder Runs held all over the world, mostly "announced" through word of mouth between training partners. I even found an "official" site of Beer Mile rules and records. Clearly, these beer races have resonated with runners all over the world. for decades. As I am prone to seek deep significance in juvenile activities, I couldn't help ask myself "Why so many Chunder Runs?" I believe its because runners are constantly pushing limits, managing physical discomfort in their bodies, and finding enjoyment doing something most people find dreadful. That basically describes a Chunder Run, which explains why they are an enduring, if underground, part of running culture. For over thirty years, I've been in favor of women's breasts. And so when Linda, my wife to be, spent the weekend camping with her girlfriends on a big sisterhood extravaganza, I headed over to Ft. Mason in San Francisco to The Breast Fest. It's a beer festival raising money for The Charlotte Maxwell Clinic to provide breast cancer services for low income women. In its 10th year, over 40 Northern California brewers poured from both their standard offerings with a few specials mixed in. But if you ask me, the surprise hit of the afternoon was Metal Shop, a cover band having way too much fun wearing wigs, spandex, and leather pants while playing 80's hair metal covers. Any band that can make the insipid, minor throwaway hit "Lick It Up" by Kiss actually sound good must be doing something right. There's just a simple exhilaration in pumping your fist to absurdly lightweight lyrics like "We're not going to take it / No, we ain't going to take it!" or "Here I am / rock you like a hurricane". Can someone tell me why I was listening to those whiny, weepy, and downright depressing bands like The Cure, Echo and the Bunnyman, and The Smiths back then? But let's not get distracted from the important issue at hand, women's breasts. On a few occasions, Linda and I have had conversations about large breasts displayed by women we've noticed. Now guys, I hope I don't need to tell you that if you going to talk about large breasted women with your better half, make sure she's the one who brings it up. Of course, Linda starts talking about women with large breasts because she enjoys watching me tip-toeing around the land mines of that particular topic. After discreetly analyzing the plastic surgery performed on a few women, I would have to say on a strictly primal urge basis, bigger is not better. In fact, out of proportion, over stuffed and simply irregular looking breasts inspire the exact opposite of the male mating instinct, no matter how big they are. As for Linda, I love her for her mind and respect her whole body. But I've got to say I'm more into her breasts than say, her ankles. And so in the spirit of bigger is not better, let me praise a few beers I sampled at The Breast Fest which were not the big beers typically served at festivals as breweries try to out do each other. Instead, let me review four beers I enjoyed that instead of going big, were supple, perky and a little bouncy. Checking in at a mere 3.5% abv, I won't forget this nifty little session beer from Ale Industries anytime soon. It's got this great nutty flavor with a slight little caramel note to go with it. Since I prefer malt forward beers, had to love a session beer that gets its flavor from primarily from the malt, instead of hops or yeast you find in most session brews. Brewery owner Brendan Moylan is getting married this year, and produced this to celebrate. It's a golden ale with a little extra hop kick that's creates a really fresh, crisp, and refreshing beer. That's it. Not twelve different flavor notes, just something simple, crisp, and refreshing. Trust me, you don't want complications in your marriage. The Moonlight Brewing server explained the beer was made without any hops, with pine needles instead. As I continued to ask pesky questions about this beer served from a tap marked "Special", the friendly Moonlight server grew less and less friendly. After doing a little post-festival research, I believe I was having Moonlight's "Uncle Svenson". This Scottish Gruit had smooth, dark, and smokey malt character much like a light Scottish Ale, with the pine needles giving a little piney and juniper character, with a slight menthol finish. It's not for everyone, but I found this change of pace beer intriguing and enjoyable. Porters are one of my favorite styles, and this one just seemed to hit all the right porter notes. Plenty of black patent malt in this one, giving it a slightly astringent character with a nice roasted coffee flavor to it. A porter done well in the classic English tradition is one of life's simple pleasures. I played soccer as a kid. My strategy was basically to run around all over the field after the ball, and if I got to it, I would kick it in the general direction of the opponent's goal. If someone from the other team attempted to dribble by, I'd take a mighty swing with my leg, and kick either the ball or the other guy's leg pretty hard. This simple technique made me a pretty effective defenseman. But I still follow soccer, and love the celebration of the beautiful game which is the World Cup, a March Madness for the whole world if you will, held every four years in June. And if you hadn't heard, Spain won the championship in a hard fought match 1-0. It wasn't the most pretty soccer mind you, but thankfully Spain scored the winning goal with just a few minutes left in extra time, preventing the greatest trophy in soccer to be won in the worst way imaginable, on penalty kicks. So to celebrates Spain's victory, the Beer of the Month for July is Alhambra Especial Premium Lager from Spain. For a lager, it's rather malty and has this slight caramel twang to it, with slightly tingly carbonation, and a very light earthy and slight grassy hop finish. I can't help wondering if the light hop touch is by design, or due to the long trip from Spain to the San Francisco Bay area. A little extra hop bite wouldn't hurt it. Either way, it's a fresh and substantial lager to enjoy while toasting the Soccer Champions of the World. The Session is a monthly collaboration of beer bloggers and writers who write from their own perspective on a single topic. Each participant posts their contribution on their site on the first Friday of the month, with The Session host picking the topic and summarizing all the contributions. This month, The Session host is, well, me! So I ask for this 42nd Session that you write about a special place in your life, and a beer or brewery that connects you to that place. It can be the beer from your childhood home, a place you once lived, your current hometown, a memorable vacation you once took, or a place you've always wanted to go to but never had the chance. Please take a few moments to think about the how the beer connects you to this place, and share this with us. Of course, the definition of "place" is rather open ended, and in some cases, highly debatable, so it will be interesting to see the responses on what constitutes a place. You can either provide the link to your Session contribution with a comment to this post, or you can e-mail it to me at "derrickwp (at) earthlink (dot) net". E-mailed submissions in text form will be posted on this site with credit given to the author should anyone wish to participate this way. I look forward to what you all write on August 6th, and will post the summary a few days later. And don't forget, The Session is always a great reason enjoy a bottle or two from that special place and tell us about it. Cheers! For this month's Session, Lugwrench Brewing asked us to write about Craft Beers Inspired By Homebrewing. Here's my take on this topic. 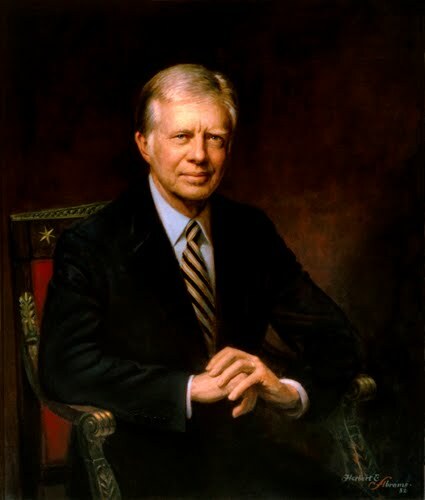 Jimmy Carter was elected the 39th President of the United States of America in 1976, and noteworthy accomplishments during his Presidency include negotiating a peace agreement between Egypt and the Israel in the Camp David Accords, installing solar panels in the White House to raise awareness of the energy crisis, and confronting the Soviet Union on its invason of Afghanistan. After his Presidency ended in 1980, he built homes for the homeless all over the world as a key advocate for Habitat for Humanity, and served on many international diplomatic missions, ultimately winning the Nobel Peace Prize in 2002. But for most craft beer drinkers, his enduring legacy as a public servant was cemented on October 14th, 1978, when he signed H.R. 1337 into Federal Law. This innocuous bill, which mainly dealt with excise taxes on trucks, buses, and retirement plans included a Senate resolution, largely credited to California Senator Alan Cranston, which gave states the right to legalize home brewing. Several states quickly granted their citizens the right to brew beer in low quantities for their personal use, and the craft brewing community generally looks back on the day Jimmy Carter signed this obscure tax bill as the day the craft brewing revolution was born. It's a story most craft beer aficionados are aware of, but nobody seems to ask why it was this small act of alcohol deregulation launched the craft brewing revolution, and not something else. Why wasn't it the far more sweeping repeal of prohibition? Or the passage of some other minor law? How did allowing a small group of hobbyists to legally brew beer in small quantities evolve into the multi-billion dollar craft brewing industry? Of course, you cannot legally sell homebrewed beer, but the prevalence of legal homebrewing exposed more people to alternatives to the light lagers dominating the market. And many home brewers were learning in their own way to be commercially brewers. But to my mind, this really doesn't explain how craft brewing went from totally under the brewing industry's radar to a force that has large, multi-national corporations back on their heels as it steadily gains market share. I believe the reason for this dramatic turn of economic events caused by a bunch of backyard homebrewers is that they created a "disruptive technology", as described by Harvard Business Professor Clayton Christensen, who popularized his theories in 1997 with his book, The Innovator's Dilemma. Christensen noticed that revolutionary business change often came from unexpected directions, from technologies actually considered inferior to incumbent technologies, and which established businesses had very sound reasons to ignore. And yet, these disruptive technologies would later revolutionize industries, with upstart companies embracing disruptive technologies overtaking established incumbents. Christensen largely cited case studies from the computer, communications, or electronics industries, which we normally attribute to technological change, to prove his points. But I believe his theory on disruptive technologies and economic change explain why so many small breweries founded by homebrewers popped up all over the United States. To explain this, consider what Christensen wrote about disruptive technologies. "Generally, disruptive technologies underperform established products in mainstream markets. But they have other features that a few fringe (and generally new) customers value." The first legal home brews in the late 70's were beers most people found strange and unusual, if not outright undrinkable by those accustomed to light lagers. But some found these unique and flavorful beers highly appealing, to the point they would tolerate the uneven, and sometimes poor quality of homebrews from that time, when homebrewers had far fewer resources to guide them as they do today. "...technologies can progress faster than market demand...means that in their efforts to provide better products than their competition and earn higher price and margins, supplier often "overshoot" their market: they give customers more than the need or ultimately are willing to pay for. And more importantly, it means that disruptive technologies that may underperform today, relative to what users in the market demand, may be fully performance-competitive in that same market tomorrow." Mainstream brewers in the late 70's and 80's could offer only barely perceptible improvements to their customers. With their light lagers highly engineered to be have attributes like "less filling", "tastes the same every time", "lightly drinkable", and "price competitive", they were somewhat boxed in a corner, with little they could further add to their products. On the other hand, homebrewers commercializing their beers were learning new and better brewing techniques leading to better beer quality and consistency, as well as new styles and flavor combinations. And each successive significant improvement earned them additional customers, while larger breweries had really nothing new to offer. Over time, home brewers turned businessmen learned to produce a more commercially viable product as they continued to learn how to better deliver what their customers wanted, and more and more consumers learned these smaller breweries had more to offer. "..the conclusion by established companies that investing aggressively in disruptive technologies is not a rational financial decision to make, has three basis. First, disruptive products are simple and cheaper, they generally promise large margins, not greater profits. Second, disruptive technologies typically are first commercialized in emerging or insignificant markets. And third, leading firms' most profitable customer don't want, and indeed initially can't use, products based on disruptive technologies." Why didn't large corporate breweries recognize what these growings legion of homebrewers turned commercial brewing doing, and introduce their own alternatives to their light lagers? After all, they employ some of the best brewers in the world. And with their deep pockets, shouldn't they financially outlast the typical homebrewing entrepreneur, who often went deep into debt pursuing their passion? It is not because these large corporate brewers are blundering, stupid and inept. It's because they were listening to their customers, trying to give them more of want they wanted, and ignoring a small market segment that was not very profitable. Which left the opening home brewers turned commercial brewers seized in the pursuit of their dreams, and now the large corporate breweries are trying to play catch up by doing things like InBevAB investing in breweries like Widmer Brothers and Goose Island, or MolsonCoors launching their own niche, craft-like brand Blue Moon. So for this session, let's salute the homebrewers who have gone on to produce the craft beer we are all grateful for, and the President who made it possible. And without Jimmy Carter's signature, we'd probably all still be drinking stuff like Billy Beer.